The Peoples’ Global Conference (PGC) against the IMF-World Bank have successfully concluded their activities on October 13, 2018 despite the repressive actions of the Indonesia government of Joko Widodo in complicity with the IMF-World Bank. More than 150 individuals representing 93 organizations from at least 18 countries participated in decentralized programs and activities of the PGC to reflect on and analyze issues, share solidarity messages, and participate in cultural presentations. On October 11, participants conducted a study conference to probe the impacts of IMF-World Bank on sectors such as peasants, workers, indigenous peoples, and migrants. Highlights of the discussions were presented on October 12 in a plenary session attended by over a hundred international and Indonesian people’s movement and civil society groups. 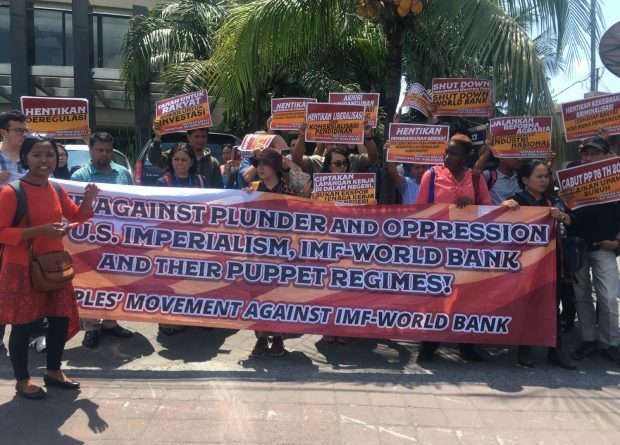 Participants also gave accounts of the protest action that they conducted inside the Bali International Convention Center where the official meetings of the IMF-World Bank were held. Participants from countries in Asia, Africa, and Latin America shared inspiring stories of their resistance and struggles against IMF-World Bank. The activity ended with a discussion and adoption of the PGC Declaration. In the evening, the Indonesian people’s movement also held their own PGC with the international participants. Outside the plenary sessions, the PGC also conducted sectoral and thematic workshops on workers, peasants, migrants and women concerns on October 13 in various locations. Throughout the week, civil society organizations directly engaged the IMF-World Bank in its sessions in the Civil Society Policy Forum and raised timely interventions. In the evenings, international and Indonesian participants shared cultural performances and solidarity speeches. Mass mobilizations were also held as part of the program to engage the wider public on the impacts of IMF-World Bank programs and policies and the necessity of resistance to these. “We are encouraged by the perseverance and resilience of the people’s movements, non-government groups and people’s rights advocates who went to Bali to participate in the PGC. We are elated with the outpouring of support from organizations who accompanied us in asserting our right to be heard and in challenging the monopoly of big corporations and international financial institutions like the IMF and World Bank over the development discourse,” said Ivan Enrile, campaign coordinator of People Over Profit. The Declaration also slammed the new agenda of the IMF-World Bank as a rehash of the neoliberal development narrative that seeks to pave the way for tighter corporate stranglehold over critical sectors while bleeding public resources dry to guarantee more lucrative income streams for foreign investors. The Declaration of the PGC furthermore expressed the commitments that participants have forged: continue to expose in every arena of struggle the key role of IMF-World Bank in the corporatizing development at the utter expense of the people, creating a front of indebted countries demanding non-repayment of IMF-World Bank loans and to create an alternative multilateral financial cooperation mechanism anchored on people’s rights and sovereignty. Rafael Mariano of the International League of Peoples’ Struggle (ILPS) International Coordinating Committee also declared that the PGC was just the beginning of a wider movement led by peoples from the South against international financial institutions. ← Shut down the IMF-World Bank, not the people’s dissent!